Exciting Times! The annual seed search has now begun. It is indeed an exciting time for gardeners. As the snow flies outside our windows, we sit by the fireside and dream of beautiful flowers in full bloom, and a bountiful garden filled with our favorite herbs and vegetables. You may be surprised to learn that gardeners begin their annual seed search on Christmas day. On December 25th online garden stores see a huge uptick in traffic on this day. As we progress through the month of January, more and more gardeners seek out and buy their favorite seeds, along with something new to experiment with, to test and expand gardening skills. What are you waiting for!? Start your search today. Important Note on Your Seed Search... Many of you begin your seed search every year right here from our site. Some of you may have missed our big announcement in November. After 20 years in the business, we have closed our garden store. It has been a great experience with many wonderful, long term customers. We now move on to retirement, so we can spend more time with our favorite hobby.... gardening! And, we will continue to grow the depth and quality of Garden Hobbies, and our other content sites. In Search of Seeds! Each year, we begin our gardening season with a search for seeds for the upcoming year. It's a lot of fun browsing seed catalogs, and surfing the internet for a treasure trove of promising garden seeds. Whether you like to browse through a seed catalog by the fireside, or surf online, make plans now to find the seeds that you want to plant this spring. Garden Seeds - find seeds, learn about the different types. Indoor Plant Starts - Starting seeds indoors to transplant later, is one of the early joys of gardening. Why let the garden stores have all the fun, when you can start your own seedlings!? While winter goes by, review the basics of seed starting, and seedling care. As a rule of thumb, most indoor starts should be planted six to eight weeks before the last frost in your area. 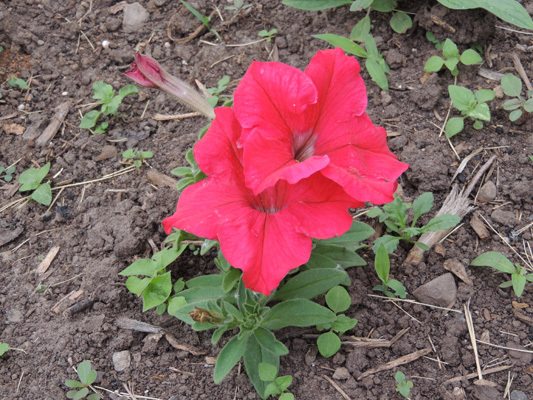 Pest Control - Your flowers and veggies are up and growing. ......kewl! You are anxiously awaiting the harvest. So are the birds, deer, rabbits, and a vast army of other pests. Check out the Buffet Buster! It ends their snack time...period. Read the Good Book.... There's plenty of good books on gardening. Reading a book on gardening, or your favorite plant, is a great way to help the winter months go by quicker. There's always something new to learn when you dig into gardening related books. There's also plenty of tips and learnings in our growing list of "how to" pages. So, make sure to surf our site and stop back often. April Garden Tips - from The Gardener's Network, where every day is a gardening day! Homeowners love Arborvitae. Fast growing with little care, they are among the most popular of evergreens for both foundation plants and hedgerows. More on Arborvitaes. April 7th - Caramel Popcorn Day This tasty, chewy treat is great. April 19 - National Garlic Day - How's your breath!? April 22 - Earth Day - Not really a gardening day, but an earthly environment holiday that all gardeners appreciate and support. April 23 - National Zucchini Bread Day - they hold this at a time when you are not sick of all that zucchini. April, Last Friday - Arbor Day - It's also called the "Tree Planter's" holiday. See our complete list of Special Days.